Now it came about in those days that a decree went out from Caesar Augustus, that a census be taken of all the inhabited earth. This was the first census taken while Quirinius was governor of Syria. And all were proceeding to register for the census, everyone to his own city. And Joseph also went up from Galilee, from the city of Nazareth, to Judea, to the city of David, which is called Bethlehem, because he was of the house and family of David, in order to register, along with Mary, who was engaged to him, and was with child. And it came about that while they were there, the days were completed for her to give birth. And she gave birth to her first-born son and she wrapped Him in cloths, and laid Him in a manger, because there was no room for them in the inn. And in the same region there were some shepherds staying out in the fields, and keeping watch over their flock by night. And an angel of the Lord suddenly stood before them and they were terribly frightened. And the angel said to them, "Do not be afraid; for behold, I bring you good news of a great joy which shall be for all the people for today in the city of David there has been born for you a Savior, who is Christ the Lord. 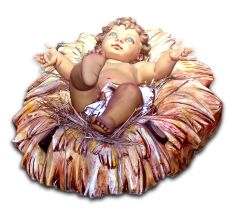 And this will be a sign for you: you will find a baby wrapped in cloths, and lying in a manger." And suddenly there appeared with the angel a multitude of the heavenly host praising God, and saying, "Glory to God in the highest, and on earth peace among men who whom He is pleased." And it came about when the angels had gone away from them into heaven, that the shepherds began saying to one another, "Let us go straight to Bethlehem then, and see this thing that has happened which the Lord has made known to us." And they came in haste and found their way to Mary and Joseph, and the baby as He lay in the manger. And when they had seen this, they made known the statement which had been told them about this Child. And all who heard it wondered at the things which were told them by the shepherds. But Mary treasured up all these things, pondering them in her heart. And the shepherds went back, glorifying and praising God for all that they had heard and seen, just as had been told them.